If only the author of this 91 year-old article had the advantage of a crystal ball so he could see just how miniature cameras would become. I'm sure he would be amazed to see my credit card size camera and all the things it can do. His take on street photography hasn't changed much in 91 years, though. After reading this article take a look at street photography today in Sidewalk Serendipity. Well, I should say so. My gracious, yes. There is no possible doubt about it that I can see. The miniature camera is the thing. For getting away with it there is nothing that can touch it. For perfect abandon in picture-making give me the miniature camera or give me death. It is really quite astonishing what things you can slip over. Street photography, for instance. When you are using a regular camera everyone dodges or swerves out of range—except the newsboys and ragamuffins, who at once cluster around and make you nervous and fidgety. Newsboys are a pest, anyhow. You can't even slip your hand into your pocket for a match without having half a dozen pounce upon you to buy a paper. And as for street photography, when they are onto you, it's simply out of the question. Unless you have a miniature camera. With this you can snap the whole street before it knows it. Young men and maidens, old men and hussies, apple women, teamsters, cops, and palm beachers—you can get them all before they are wise to your little game. It is so easy that it is quite a shame. Think, for example, of some of the pictures I have recently made. There was the man in front of the restaurant. I had been gormandizing within on a ham sandwich and a glass of milk and in spit of my overloaded stomach had managed to stagger through the portal onto the public thoroughfare without. As I did so I noticed Mr. Wellfed standing just outside the doorway. He wore a trunk-strap for a belt, for his was bigger round than he was high, and he was ferreting amoung his Teddies with a handsome hand-tooled American tooth-pick. Quite an impressive figure. I was struck by him at once. And, quite naturally, having an eye for artistic beauty, I was moved by an irresistible impulse to take his picture. With a regular camera I shouldn't have got it. In the first place, I shouldn't have had the regular camera along, and in the second place, my movements would at once have aroused his suspicion and caused him to conceal his head and feet behind one of the massive pillars nearby. It was the work of only a moment, however, to slip out the miniature camera, focus it, and then negligently turn around and get him at the climax of his mining operations. The miniature camera is certainly a wonder. The most satisfactory part of the whole proceeding is the thought that this paunchified gentlemen, if such he may be called, has to this very moment no idea whatever that his actions have been thus imperishably registered on my tiny strip of film, and that he may be yet further enlarged and projected onto the pages of some photographic magazine. Think what a strange hold the miniature camera gives you on the American public. Of course it does not require quite the same amount of strategy to get a picture of a building before it has become aware of what you are at and has shiown resistance to your efforts. A building is more considerate, also slower in its movements. 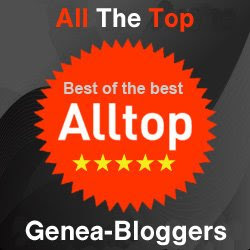 it does not become aware of you immediately, so that if you are circumspect and creep up unobtrusively you can even manage to get it with a view camera, if you are not too slow. But to get a building and figures, figures that really go with it and set off its charms, is quite a different matter, and you really have to hacve a miniature camera if you are going to be sure of your prey. And then, there is the wondeful motion-stopping power of the miniature camera which has been so widely e4xtolled. This may prove indispensible in some places, especially on the Pacific Coast, where earthquakes may suddenly start the big structure bowing and scraping to each other to such an extent that a stand camera would be absolutely useless. Indeed, I can't think of anything quite so perfect for earthquake photography as a miniature camera. You can get the picture even before the earthquake itself is up to whatyou are about and has had a chance to drop a chimney or two onto your brand new Leghorn. I could write a whole book about the convenience and possibilities of the miniature camera, but the secret of making a profound impression is not to say too much. Also, I am getting pretty near the end of the column, and so I will simply close with the advice to buy one quick, before they are all sold out. Leghorn - A straw hat. Instigator. “Local Manipulation.” The Amateur Photographer's Weekly, August 24, 1917, 155. Unknown. The Newsboy. 1922. Library of Congress Prints and Photographs Division Washington, D.C. 20540 USA. Current location of original document. Prints and Photographs. 19 May 2008 . 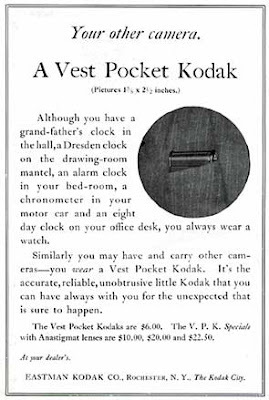 A Vest Pocket Kodak. "Advertisement." The Amateur Photographer's Weekly, July 6, 1917, Inside Back Cover.